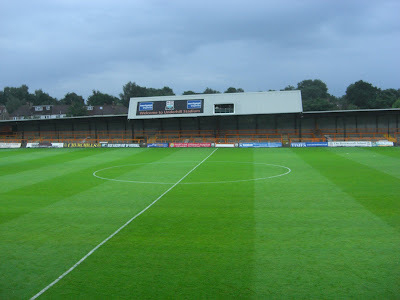 My fortieth stadium of 2011 was on Wednesday 20th July 2011 at Underhill Stadium in Barnet, London. The match was Barnet vs. Gabala in a friendly game. Underhill Stadium was less than half a mile from High Barnet tube station at the end of the Northern Line. 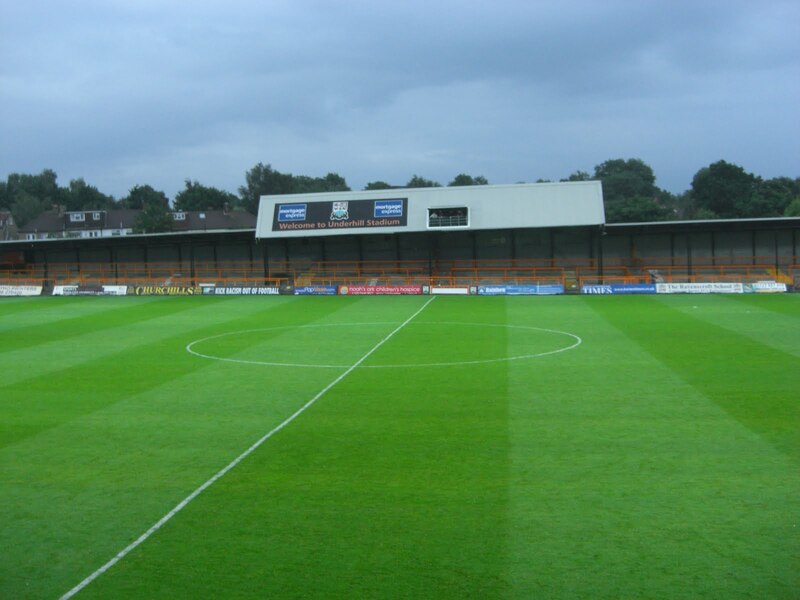 The ground was home to Barnet from 1907 until April 2013 when the club moved six miles west to Harrow and their new venue at The Hive. Underhill was famous for the fact it was built on a hill and so the pitch sloped downwards from north to south. The ground was a mish-mash of seating and terraces and had several stands. The west side of the ground contained the Main Stand which could hold around 800 fans. Due to the small crowd this was the only stand open for this game. The stand was raised up to give better views and takes up around half of the space on its side of the venue. To the right of it was the small Family Stand which sat at ground level and held 250 people. The South Stand was a new 1,000 capacity all-seater area which was built in 2008 but when I visited the ground the interior of it remained unfinished. The East Terrace ran the length of the pitch opposite the main stand. The 2,500 capacity stand was the largest in the ground and was split into three sections for fan segregation purposes. At the north end of the ground was the dated looking North Terrace which could hold 1,200 supporters and finally, there was a North East Family Stand which was a temporary structure designed to provide seating to away fans. The game was a pre-season friendly between English League Two side Barnet and Azerbaijan Premier League side Gabala. The home side started out strongly and were awarded a very early penalty which they then missed. A few minutes later however Barnet did get the ball in the net, with a neat finish from a whipped ball into the box. Barnet continued to press and squandered several chances to extend their lead before the break. The second half was a very poor spectacle with little created by either side and so the match finished 1-0 to the hosts. Nice ground...cute! I didn't even know they played football in Azerbaijan!